Last Gasp: Fill this lane with 1/1 Angry Villagers. Prized Chicken is an epic Neutral creature card. It is part of the Heroes of Skyrim expansion. 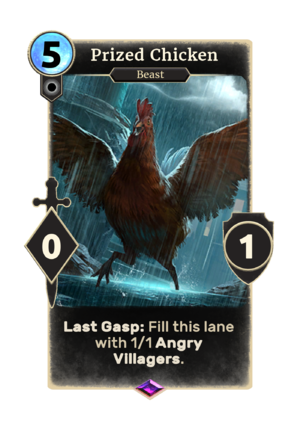 This card is a reference to Skyrim, where if you kill a chicken in the middle of a town, all inhabitants will become hostile to the player.